MTV3's F1-expert Erkki Mustakari finds various reasons why Kimi Räikkönen would not continue as a Ferrari's F1-driver next season. Ferrari's head manager Luca di Montezemolo announced on Wednesday that the team has a contract with the brazilian driver Felipe Massa but that they don't know his next years team mate yet. - This does strongly indicate that Kimi won't drive at Ferrari for next season, if the case is that Massa is confirmed for next season and Kimi isn't, and still Massa is the only one of the two drivers who is injured, Mustakari says. Kimi's future and potential transfer has been the subject of the media for months. Fernando Alonso has been seen as the most likely follower for Räikkönen. - The only thing we know is that Kimi has a contract with Ferrari for next season and then we know that a huge amount of rumours have been transfering Fernando Alonso from Renault to Ferrari for next season. - In Finnish this means that Kimi probably won't drive in Ferrari next season and has to find himself another job. Montezemolo said on Wednesday that the team wants to give Massa, who was seriously injured in Hungarian GP, a second chance in the team. - One possible explanation is that Ferrari believes that Massa is as good a fighter for a world championship with a good performing car as what Kimi Räikkönen has been. Furthermore it's tastes and smells like they want to give Massa a chance after the Hungarian accident and don't want to throw him over the fence at a situation like this, Mustakari examinced the reasons for naming Massa. Ferrari's boss promised also to announce the second driver in a few weeks. Mustakari thinks Kimi's future in F1 depends on what team he chooses - if he chooses a team at all. - It strongly seems like if [the second driver of Ferrari] would have been Kimi Räikkönen then they would have announced it already. It smells like Kimi won't drive at Ferrari. - One option is that Kimi won't drive at any team. 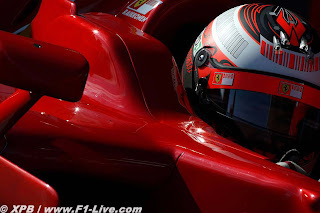 And the second option is that Kimi drives in a team that is competitive enough in Kimi's opinion. First what comes to my mind is possibly Brawn GP and possibly Red Bull Renault if they have Renault's engines next year. And even a comeback to McLaren-Mercedes. Other options Kimi most likely won't consider, Mustakari predicts.